If you are interested in implementing Motorized Drapery to any room in your home, Please call us for a consultation to discuss your project; Amazing Window Fashions will provide you with the best and most cost effective solution. We have installed hundreds of motorized drapery both in Residential and Commercial. Our experts will review your project while our designers help you choose the Perfect covering. 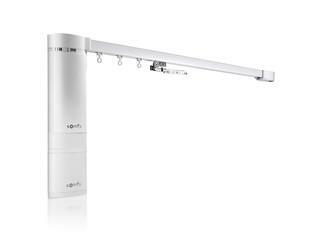 Glydea provides discreet, flexible and robust solutions for motorizing all types of draperies and with wide choice of control options. You can control your window coverings while you are away via a Smartphone or a tablet. It extends the lifespan of draperies by minimizing the damage associated with manual operation. This motorization system is Compatible with all types of draperies and broad range of controls, sensors, timers and third party automation systems. Irismo™ 45 WireFree RTS is a battery operated, compact solution to easily motorize draperies. This is a Great solution for reducing glare or creating instant privacy. Open or close draperies as easily as pressing a button. Control from virtually anywhere using a smartphone/tablet app. Rechargeable battery offers an added convenience! Reduce energy consumption by up to 40%. Add optional sensors or timers for automatic control. This Motor has 5 year warranty. The Irismo™ Mini DC is a friendly, low-voltage and discreet solution to easily motorize draperies, a Perfect solution to reduce glare or create instant privacy, Open or close draperies with the simple press of a button, Superior, reliable performance, a Smartphone/tablet app provides control from virtually anywhere, Reduce energy consumption up to 40%, Protect valuable furnishings from harmful UV rays, add optional timers or sensors to provide automatic control. Has a Built-in RTS module (compatible with all RTS control options).